Nice! caramel, molasse, sweet, that is for sure, but great to sip after a nice dinner.Nice designed bottle. Nice, but sweet Nice nice nice, but you need to like the sweet, very sweet taste it leaves in your mouth. Fine for after desert. Green green grass of ... In fact not that bad, grass in the nose, for sure a rhum agricole, but also apricot, peach... in the mix, for sure, but nice, bearing this in mind. An option in a bar with little choise OK. No more no less. Into a rum to drink pure and little choise in the bar you're frequenting? This is a no risk option then..
mix it Ok for mixed drinks I guess, since I prefer the pure stuff and rarely mix, not one I will order again..
Won't buy it... For the price, like others remarked already, there is better, not pleasant in the mouth, taste of gasoline even.. Not my cup of tea, sorry rum.. 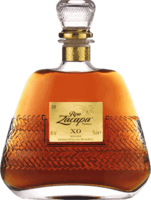 Spiced Rum from France Blend of different rums, assembled in the région of Cognac, France, the company promises a savoury and strong rum, fruity and smoked at the same time. Mix it For Ti-punch, and that's it. End of story, nothing to add.